Pierre-Emerick Aubameyang has become an emblematic figure at Borussia Dortmund, to the extent he wore the captain's armband on Matchday 8. Draft Aubameyang into your Official Fantasy Bundesliga team here! bundesliga.com: Pierre-Emerick Aubameyang, in the game against FC Ingolstadt 04 you led Borussia Dortmund out for the first time as captain. How did that feel? Pierre-Emerick Aubameyang: It was unusual, but very nice. bundesliga.com: Although you are only 27, you're one of the experienced players at Dortmund. How do you like this role among a pack of wild, young rookies? Aubameyang: Let's just say that I try to remain as young as they are, but it is quite remarkable that I'm one of the oldest players. I used to be one of the youngsters, but that doesn't bother me. It's great fun to be on the field with so many young, talented players. bundesliga.com: You have scored four goals in six Bundesliga games against FC Schalke 04. What do goals in the Revierderby mean to you? Aubameyang: Of course they mean a lot! We all know how important this derby is for BVB and the fans, and we also know that it's going to be a huge match. I'm sure we'll play a good game. We're all looking forward to it and we're ready. bundesliga.com: What do you make of the atmosphere in the run-up to a Revierderby? Aubameyang: It's a pretty special atmosphere. If you look people in the eye around here then you will feel straight away what ambition there is to win the derby. The fans tell you things like 'come on, we've got to win the derby! We want a derby win!' Everybody's really looking forward to it. The atmosphere in this game is just unique. Get involved in our #Revierderby competition for your chance to win a Dortmund shirt! bundesliga.com: To what extent have BVB changed their playing style in view of the new players who have arrived? Aubameyang: It's certainly different to last year. We've lost some great players and it's true that it was easy for me to score goals because I was playing with these outstanding players. I think that we've brought in many good players as replacements, but I can't say yet whether scoring goals has become any easier or any harder – it's still too soon in the season for that. We've got huge talent within the team and that's a fact. We've all got to work hard because we've not yet hit our peak. Particularly in a situation like this, we need everybody we can get because our injury list is pretty long right now. When we have everybody back on board, then it's going to get easier for me. bundesliga.com: Is qualifying for the Champions League the objective for this season? Aubameyang: Of course it is! We've got to be in the Champions League again next season, that's an absolute obligation, even if we've only made an average start to the season. I'm sure we'll reach our goal because we've got such a good team. Like I said, we've just had a bit of bad luck with injuries at the moment, but that can't be an excuse because we're Borussia Dortmund at the end of the day. Nevertheless, we do still need a bit of time. bundesliga.com: What does Marco Reus' comeback mean? Aubameyang: It's a good sign that he's back training again. We need Marco. I sent him a message not long ago, telling him to keep believing in himself. I also told him personally how important his return is for the whole team. Not just me, but the team, the club – everybody's standing behind him. We all hope he'll be back on the field soon. bundesliga.com: Last season, you and Robert Lewandowski scrapped it out for the Torjägerkanone. Now Köln's Anthony Modeste's leading the way. You know him well – how do you rate his performances? Head here for the current top scorer chart. Aubameyang: I sent him a message, saying 'slow down a bit!'. Seriously, though, I'm delighted for him because he's a good lad who always works hard. He got a lot of criticism in France so that's why I'm so pleased to see things going so well for him. At the same time, it's good for me because it means I'm under pressure and I've got to work even harder. It's not just Lewandowski now but also Modeste, and I like that. bundesliga.com: A fast player needs a fast car too, right? 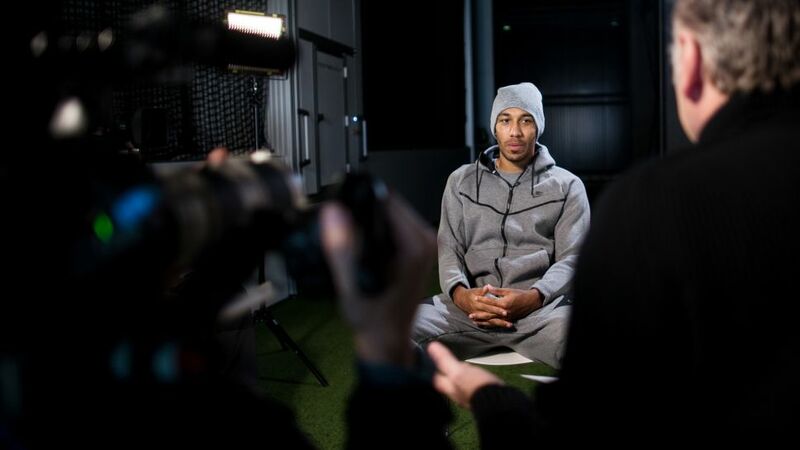 Aubameyang: Speed is a part of me. I don't know why, but that's the way it is. I think I was born with it. I've got a passion for cars and that's one of my biggest pleasures.